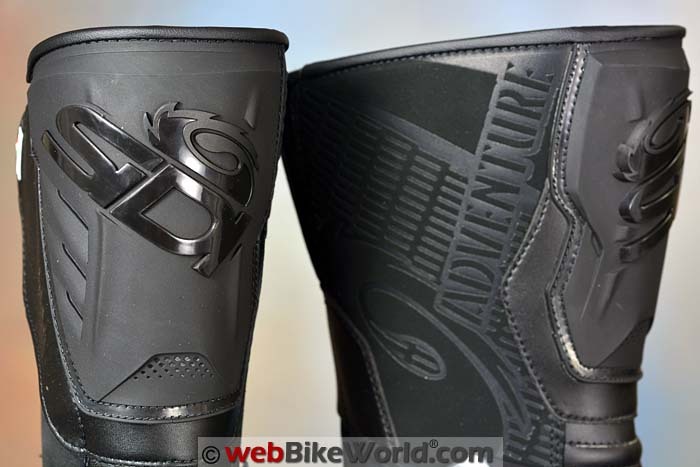 The Sidi Adventure Gore-Tex boots are at the top of the Sidi Adventure-Touring boot lineup. 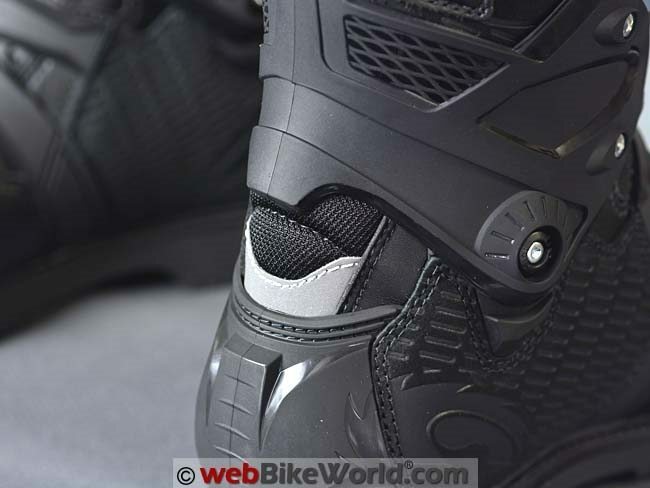 And the Sidi Adventure 2 Gore-Tex variant are arguably the best yet. The original Adventure Gore-Tex Boots (review) were so good that we just couldn’t pass up an opportunity to revisit them. Visual changes to the Adventure 2 boots are subtle. But new features and a few refinements over the well-travelled originals reviewed by Chris B. back in 2013 serve to move the bar even higher for adventure-touring footgear. The Sidi Adventure series may not be as stylish or as lightweight as the competition but they do function as day-in, day-out boots. And they work better than other boots of this type for short-distance casual walking. The fact that the Sidi Adventure 2 Gore-Tex boots are made mostly from synthetic materials may or may not be a critical factor to owners. But one thing that needs to be stressed is that these boots are comfortable, protective and essentially fault-free. They’re also not cheap…although the list price has actually dropped since 2013. But you get what is one of the most popular adventure-touring boots that are comfortable, protective and fully waterproof with Gore-Tex breathability. They’ll go anywhere and do almost anything with style and they’ll last a long time, so the investment is well worth it. 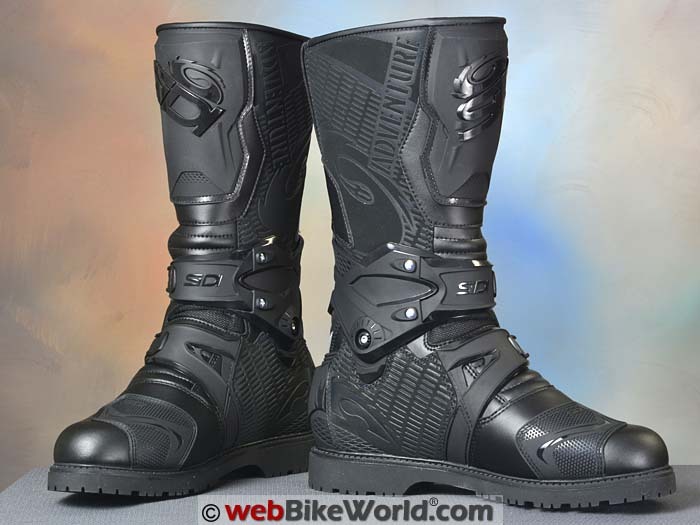 I have acquired many motorcycles and lots of motorcycling and other sports-related footwear over the years and on/off road adventure travel style motorcycle boots far outnumber any other type. Most of my riding is oriented towards off-road and adventure touring. But it doesn’t matter when, where or how — the essential ATGATT approach prevails for me and adventure-touring footwear is my de facto gear of choice no matter the motorcycle or the riding venue. Adventure touring boots provide protection, durability and typically the comfort I need for long days in the saddle, on the foot pegs or even when I’m off the motorcycle. 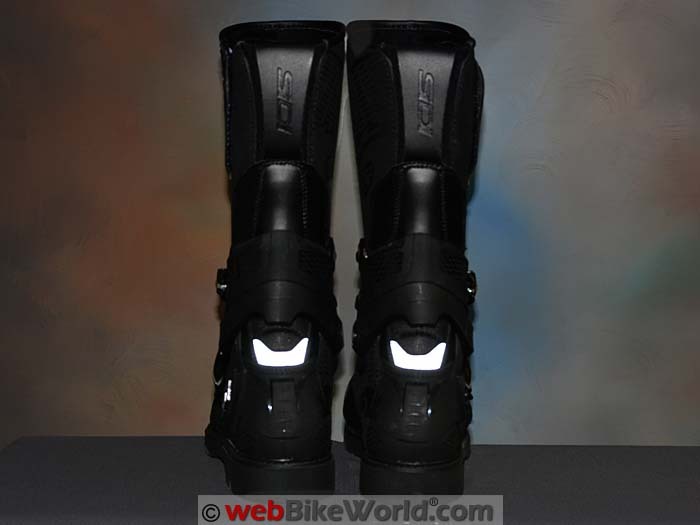 (L) Original Sidi Adventure Gore-Tex Boots. (R) Adventure 2 Gore-Tex Boots. 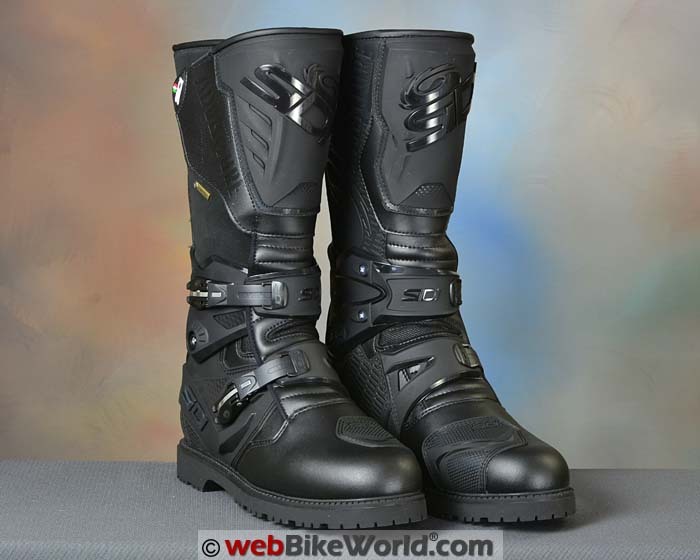 The winter is over and now I have a new pair of boots to go with my new BMW R 1200 GSW Rallye. Both getting broken in — and dirty — as riding season finally cranks up. What more could one ask for? By coincidence, I also just acquired a pair of the REV’IT! Discovery Outdry boots (review) as well. Both pair were put into use as soon as weather and road conditions allowed, although remnants of winter seem to be hanging on well into spring this year. Typically, new boots need to be worn on a few rides and broken-in, right? Well, yes and no. The Discovery Outdry boots did need a few days of on-and-off the motorcycle to get truly comfortable (appreciating the toe cramping issue). On the flip side, the Adventure 2 Gore-Tex boots, like most Sidi boots I have worn, fit perfectly and were comfortable literally right out of the box and there are no sizing issues in accommodating my feet. 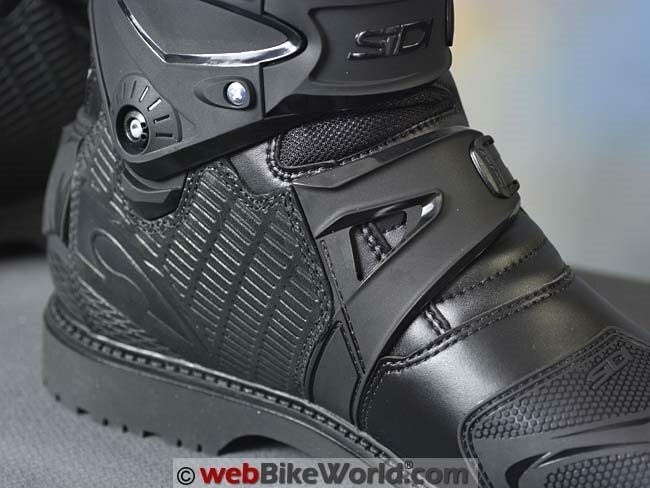 One sidebar to note: Sidi’s transition from mostly leather-based construction to synthetic boots seems to be a done deal. It was surely a change not undertaken lightly and probably not without a lot of corporate angst perhaps, especially considering Sidi’s origins as a premiere design and production facility for outstanding sports footwear. But, as they say, it is what it is. The Adventure 2 Gore-Tex boots are the third pair of synthetic-based motorcycle boots I have reviewed from Sidi and to be honest, it is truly hard to find anything wrong with them. What I do miss (in remembering back when) is the patina of aging leather, something that the newer (and durable) Sidi footwear won’t get, although that may or may not be a bad thing, depending on your point of view. 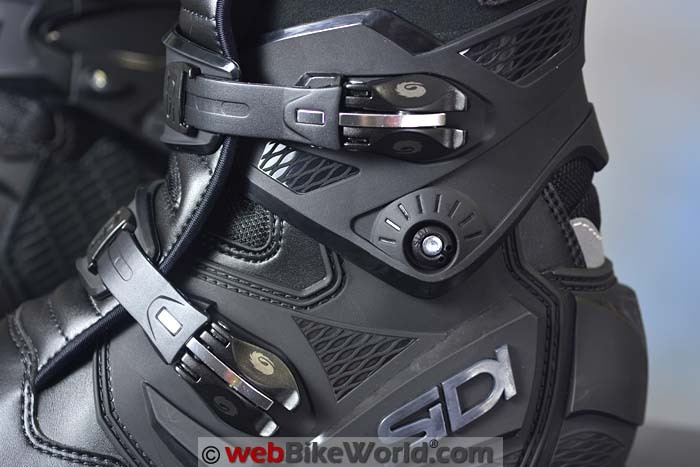 It’s been a quick 4 years since we published the original Sidi Adventure Gore-Tex boots review but that’s a long time in motorcycle boot evolution, so a refresh by Sidi was not unexpected. The Adventure 2 boots are similar in appearance to the originals but with subtle cosmetic styling changes, a few component updates and construction enhancements aimed at maintaining market position and hopefully a better product. The Adventure 2 boots are tall by design, measuring 40 cm (15.7 inches). 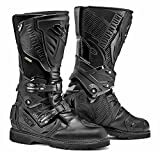 This means that they tower over many other types of motorcycle boots while providing essential coverage for the foot, ankle and the upper shin and calf areas. For me, the height of these boots is one of their best features. At over 6 ft. 2 inches tall with a 34.5 inch inseam, my build lends itself to the height provided by the Adventure 2 Gore-Tex boots. And just for the record, the Adventure 2 Gore-Tex boots weigh 2.7 kg (6.0 lbs.) total, while theBMW Santiago boots (review) for comparison weigh 2.6 kg (5.7 lbs.) and the REV’IT! Discovery Outdry boots come in at 2.3 kg (5.1 lbs. ), making them the lightest of the three. Full grain microfibre and Cordura upper with suede. Full height (14 inch) Gore-Tex liner (important for full-length water resistance). Full length sealed wide-opening inner gaiter. Two micro-adjustable straps with cam-lock style buckles. Elastic panel to expand the calf area helps facilitate entry and exit. Bonded non-slip rubber sole and removable arch support insole. Wraparound “Flex System” helps prevent “walking squeak”. TPU support at the ankle area. Large loop-style pull tab in the rear. 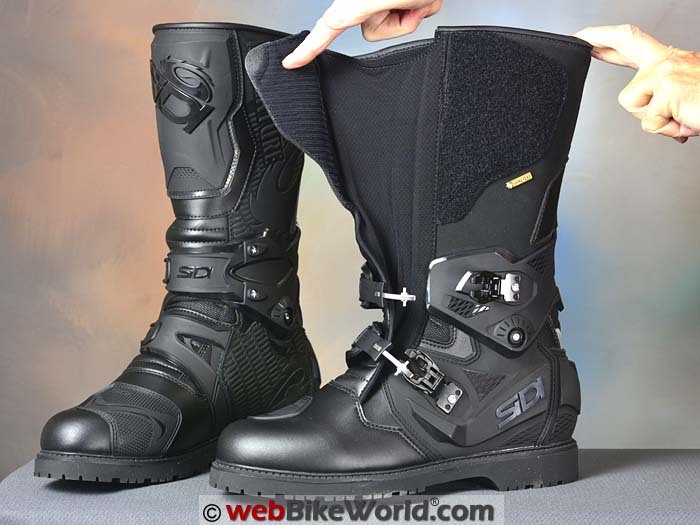 The Sidi Adventure 2 Gore-Tex boots utilize a full grain microfibre upper. This base material has many characteristics of genuine leather but is claimed to be lighter and stronger regarding tensile strength, tear resistance and flexing endurance. It’s also claimed to provide better resiliency to the ravages of time, temperature and the elements and based on our experience with other microfibre boots from Sidi, it is hard to argue the claim. 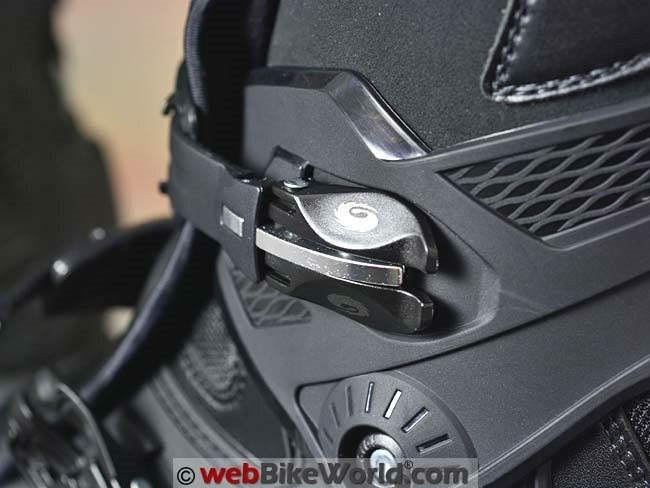 These inserts on the “bike side” of the boots also provide better feel for the rider especially when standing on the pegs. Suede absorbs surface moisture to minimize slippery water buildup, so grip or friction is maintained. The sole is a one-piece heavy duty Vibram-style lug type with two distinctive grip patterns as opposed to the distinctive multi-pattern multi-grip sole used on the REV’IT! Discovery Outdry boots. The inside of the boot is a layered composition of the Gore-Tex waterproof-breathable membrane that has grown in height by 7.62 cm (3 inches) from the original Adventure Gore-Tex boots. 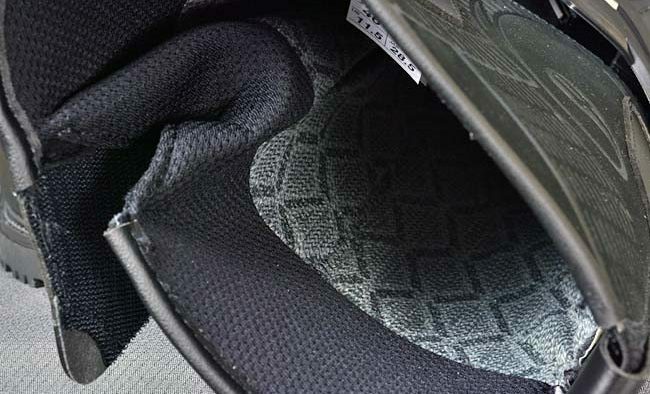 Also, the interior Cambrelle lining provides comfort and the upper is lined with Teflon which is claimed to prevent water and sweat absorption and help the interior of the boots to dry faster. These changes between the Adventure and Adventure 2 Gore-Tex boots might seem somewhat trivial, but as a whole the changes are significant and important enough for Sidi to assign the “2” version number to this release. The lining of the boots is a combination of the Gore-Tex membrane and Cambrelle, an oft-used lining that is very strong, feels soft and provides an environment allowing air to circulate around the foot to minimize bacteria build-up that can leads to less pleasant things. Between the Cambrelle liner and Gore-Tex insert, a near perfect foot environment is created to cushion and comfort the feet, manage the moisture generated by the feet and also to keep the external moisture at bay. Gore-Tex. 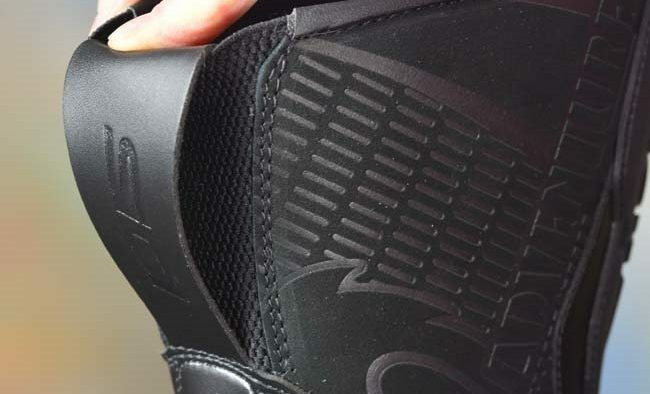 What more can we say about what is arguably the best membrane or lining to adorn motorcycle boots or for that matter, virtually any other type of footwear? But we’ll gush once more anyway. Technically, the Gore-Tex membrane contains over 1.4 billion microscopic pores per square cm (that’s 9 billion pores per square inch). And said pores are 20,000 times smaller than the average water droplet but 700 times larger than a water vapour molecule. Deduction? H2O from the outside will never penetrate, but perspiration will escape easily with less moisture held or trapped in the insulating lining. Result? Your feet (and thus you) will stay warm and comfortable when it’s cold outside, with perspiration wicked away to maintain a dry environment no matter what conditions are like, inside or outside the boots. The “Guaranteed to Keep You Dry” statement isn’t just marketing hype; it’s the real deal in keeping water from getting in while allowing perspiration to exit. And the Adventure 2 Gore-Tex boots now feature a full-height lining of this impermeable stuff, which is three inches more than what was used on the original Adventure Gore-Tex model. That makes mandatory a bigger bucket (or deeper hole) for the infamous wBW bucket test! The singular wBW Bucket Test didn’t defeat the Adventure 2 boots. In the normal course of spring riding, it came down to finding water-crossings and crud-filled ruts and overflowing ditches, all filled with glacier-cooled Canadian water. So once again we are back to the broken record loop in that nothing has defeated the Adventure 2 Gore-Tex boots in their ability to shed comfort-diminishing moisture of all forms and keep the encased feet dry and comfortable (unless submerged over the tops — oops!). 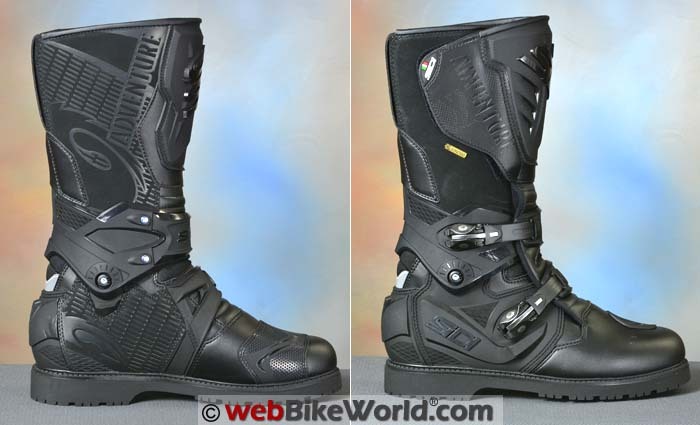 Bottom line: the BMW R 1200 GS Rallye and F 800 GSA are both dirty, as are the boots. But my feet are snug, warm, dry and safe, all contributing to rider maintenance that equates to a better and safer riding experience. Just looking at the Adventure 2 Gore-Tex boot brings a sense of heft, strength and protective ability and on your feet, they don’t disappoint. 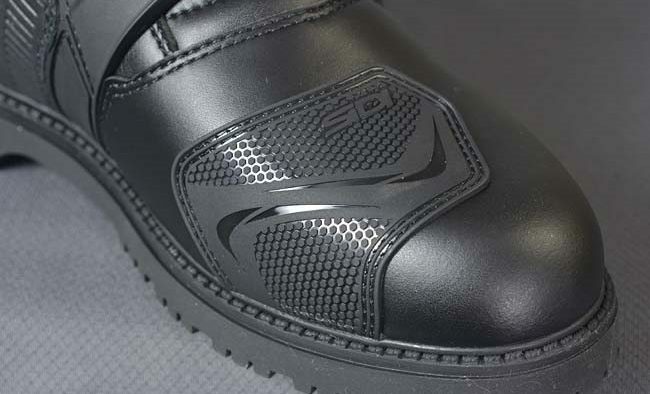 The thick microfibre upper provides much of the stiffness and base protection, with other well-placed plastic panels around the heel and lower sides adding significantly to the layered protection equation. A large frontal PU (polyurethane) shin plate is located above the instep flex section, keeping the upper ankle and (sensitive) shins protected from frontal and lateral assaults due to flying objects or semi-immovable things that seem to jump out into your path. 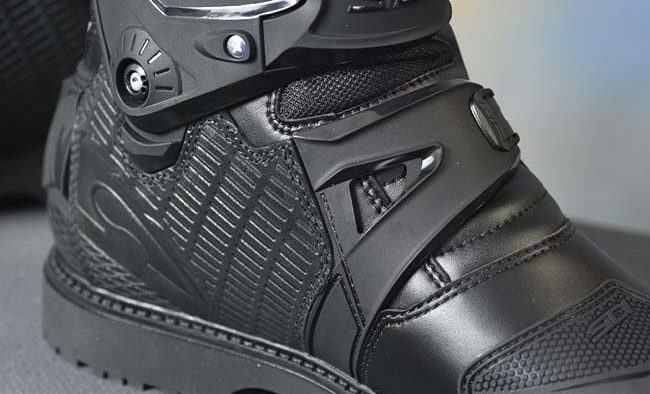 Equally welcome is the “Flex System”, a plastic support component around the ankle area that parallels the Vertebra system used on Sidi’s road racing boots. On the Adventure 2 boots, this piece along with the integrated upper cam buckle strap provides a strong supportive wrap-around and, pivoting joint for great on-peg flexibility or for when climbing over rugged terrain (been there, done that). Contributing to both closure and protection are the two micro-adjustable strap and buckle assemblies. One is located over the instep and the other above the ankle point (which is integrated with the Flex System) — become an integral part of the overall protection layering. When in use, the buckles have a low profile that is almost equal to the pivot point molding and another raised ridge molding on the lower plastic side plate. And by the way, I have never had one of the buckles release accidentally. The indented memory regulation for set-and-forget operation (until adjustment is needed) straps work well; the two buckles work independently of each other for optimum fit and support and all of the buckle components are easily replaced. Not so much technically inspired as functionally inspired, the Adventure 2 Gore-Tex boots utilize a secure approach for the closure system. It consists of a simple full-length stitched gaiter and large over-flap that secures to the outer upper boot with large stylized sections of hook-and-loop. Although not always deemed to be as “open” as a tongue-based boot, the full gaiter, along with the large over-flap closure and new calf-area expandable section, provides the means to wear your pants on the inside, depending on your calf size of course. Alternatively, with the gaiter folded and the over-flap tightened, most pant or over-pants can be worn on the outside of the boot (my preferred arrangement). With some owners, the height of the boots may cause issues in getting the pants or over-pant legs easily in place, although in an offsetting manner, the stiffness of the upper boot facilitates this action. Where the Boa System used on the REV’IT! Discovery Outdry boots can be classed as a unique and very functional feature, the Adventure 2 Gore-Tex boots take a more traditional approach, but one that is totally efficient and effective. The wide fully-stitched gaiter, strong reinforced closure, one-hand use cam-buckles and high stiff protective sidewalls provide an easy-to-use and equally effective means to seal and securely house the foot and upper ankle. And in recently wearing the REV’IT! Discovery Outdry and the Sidi Adventure 2 Gore-Tex boots interchangeably with the same over-pants, the simple high-top no-padded trimmed Sidi boots provide slightly better accommodation for pants worn inside the boot. 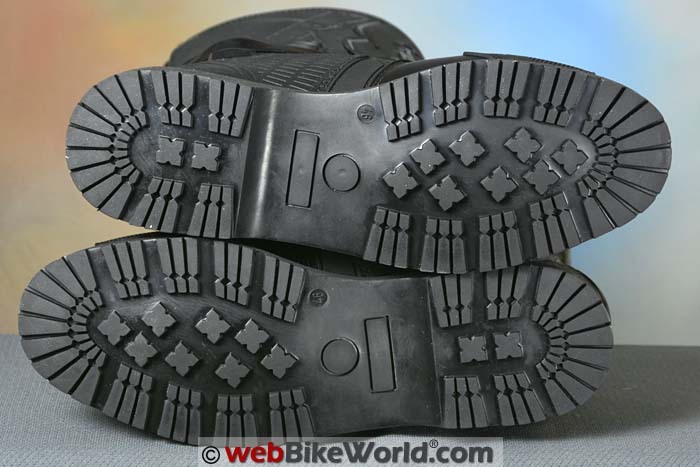 A non-slip and very grippy rubber Vibram sole is used where the boot hits the foot pegs (or the ground as it may be). 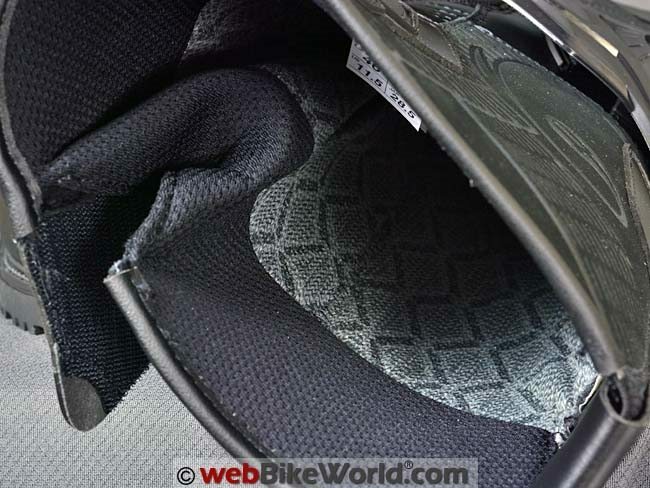 The sole area is not built-up in the same layered manner as seen on the REV’IT! Discovery Outdry boots but the cushioning, dampening and protection is there. As a one-piece bonded component, it is possible to replace the sole through the services of a good cobbler service; Motonation has a list of approved motorcycle boot repair services. Looking for well-fitting motorcycle footwear was once an exercise in frustration, at least for me and my long narrow feet. But thanks to one or two custom boot makers (remember those? ), my feet were comfortably, safely but expensively housed. 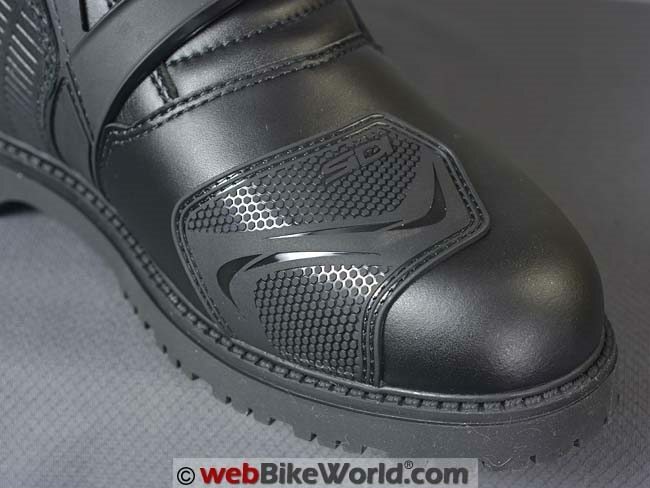 Shortly after discovering how good and well-fitting Sidi bicycling footwear could be, I discovered the same attributes were to be found in their early motorcycle boots, and thus began my now long-term relationship with the company. Over more than a few years and with more than a few pair of Sidi boots (among many other brands and types), my feet are still the most comfortable when slipping into a set of size 46 Sidi boots. It’s a perfect fit for me and provides encompassing comfort and the Adventure 2 Gore-Tex boots carry on that tradition. The heel is securely and comfortably cupped, minimizing movement and virtually eliminating slippage (forward creep). The width is just right, with well-shaped supportive walls. And the toe box has length and room to stretch the toes. About the only thing I ever do is replace the well-shaped, supportive but thin removable insole with a set of thin- to medium-weight gel inserts to bring 24/7 comfort to my aging feet. 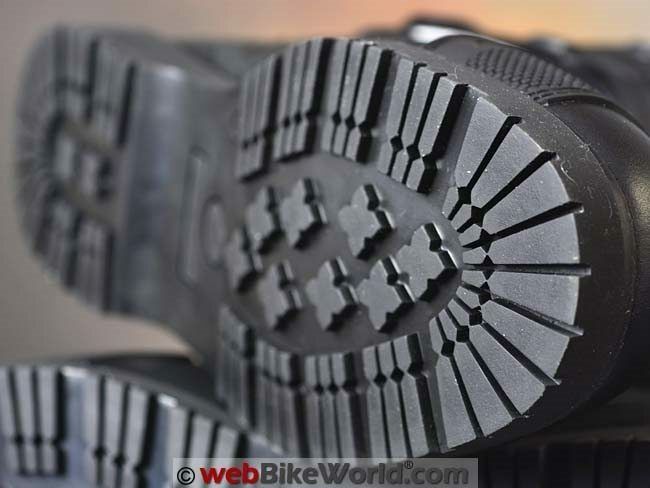 And with the above-mentioned addition of the gel insoles, walking comfort is provided as well and there are no issues in transitioning from riding to walking or long hikes with these boots — something that can’t be said about other moto-sports footwear. Not surprisingly and like virtually all Sidi footwear, the Adventure 2 Gore-Tex boots are top-notch in this category, with the only observation being a bit of stiffness. The REV’IT! Discovery Outdry boots could be contenders for overall comfort if not for the toe cramping issue I discussed in the review. As such, the BMW Santiago boots-with-character (still) hold second place. It can take a few days to get comfortable with footgear like the Sidi Adventure 2 Gore-Tex boots, the REV’IT! Discovery Outdry boots and even the BMW Santiago boots. Something to remember, these are boots and not light-weight svelte footwear that slips easily over the foot pegs and under the shifter. So sometimes it is necessary to accommodate these big boots by re-positioning the shift lever or finding a different angle for optimum access to the shifter. And while the Adventure 2 Gore-Tex boots are only about two months old, albeit becoming well used, the Flex System now keeps them from squeaking like the original Adventure model did, nor like some of my other heavier duty riding boots that always announce my arrival! In 2013, Chris B. did the outstanding review of the original Sidi Adventure Gore-Tex Dual Sport Boots and later that same year headed off on the longer haul that included part of the Trans-America Trail (ride report) — one of the best bucket-list items by the way. His bottom line in 2013? He was darn glad the Adventure Gore-Tex boots were on his feet, having saved them from injury more than once. And my bottom line in 2017? I am equally glad the Sidi Adventure 2 Gore-Tex boots are on my feet, and not just because of how good they are when riding off-road, but for all roads. Are they worth the extra investment over other adventure-touring boots that may be had for half the price (and that may have to be replaced in a couple of years)? 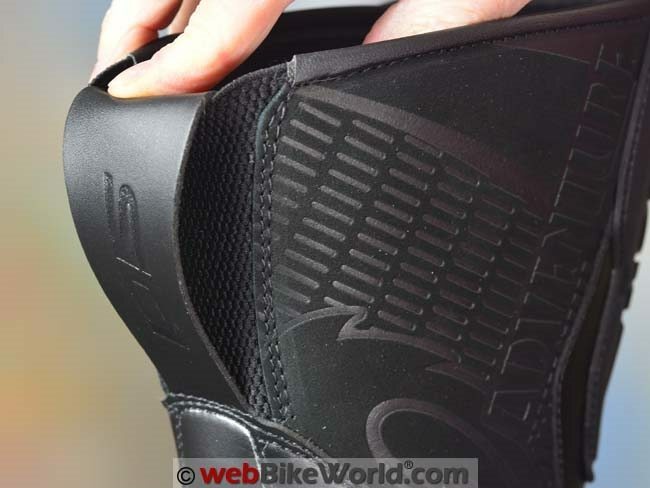 In admitting a bias as a long-term Sidi boot wearer (for track, street and off-road activities) my reply is this: if you want Sidi quality, function, performance and protection, then the answer is yes. That — and the long-term durability — aren’t in question here and no matter what the boots are made from, everything I expected in a Sidi boot is still here. Editor’s Reply: I agree, when they first started using synthetics a lot of people complained (and maybe the original synthetics weren’t that good) but now it seems better (and more humane?) than using leather. Thanks for the in-depth review. Like you Sidi had me hooked from Cycling wear, and I just received my Adventure boots. Hope they work as well as they have for you!